ST. GEORGE — It was a great game with a grand finale. Desert Hills’ Addi Betts hit a walk-off grand slam in the eighth inning Tuesday to overcome a 2-0 deficit and give the Thunder a dramatic 4-2 win over visiting Snow Canyon. Head coach KaCee McArthur said she’d urged her team as they were coming up in the bottom of the eighth to be confident when they stepped to the plate. And when she connected with the pitch, she said there was no doubt about it. 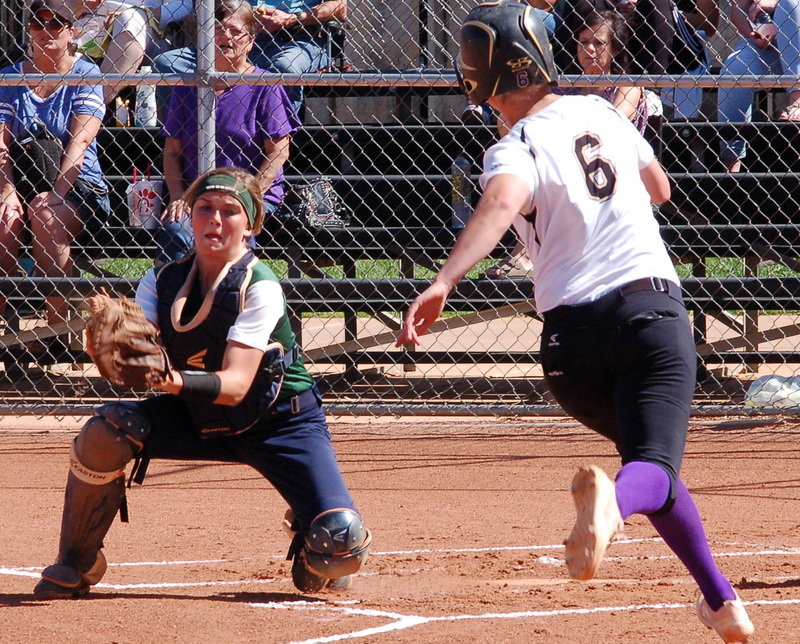 The swift, powerful ending nearly overshadowed a taut pitchers’ duel in the first seven innings as neither the Warriors’ Payten Jensen nor Desert Hills’ Brianna St. Clair surrendered a run. Both were sometimes dominant and often clutch, getting key outs to thwart scoring opportunities throughout the game. McArthur said it was the best game the Thunder (8-2 in Region 9) has played this season given that both teams played so well. “It was an evenly matched game. We had to work out of some jams, they had to work out of some jams. It was just back and forth, with both teams really wanting it,” she said. With the game scoreless after the regulation seven innings, the rules called for each team to begin its inning with a runner on second, and Snow Canyon (5-4) immediately took advantage. With Alex Demming on second, Natalie Gunn beat out a bunt that Thunder third baseman Kaitlyn Philips charged hard and fielded, but her momentum prevented her from getting off a throw to first base. Demming moved to third on the play. Gunn stole second, putting two runners in scoring position with no outs. After St. Clair struck out the next batter, Courtney Averett singled to center, scoring both runners to give the Warriors a 2-0 lead. 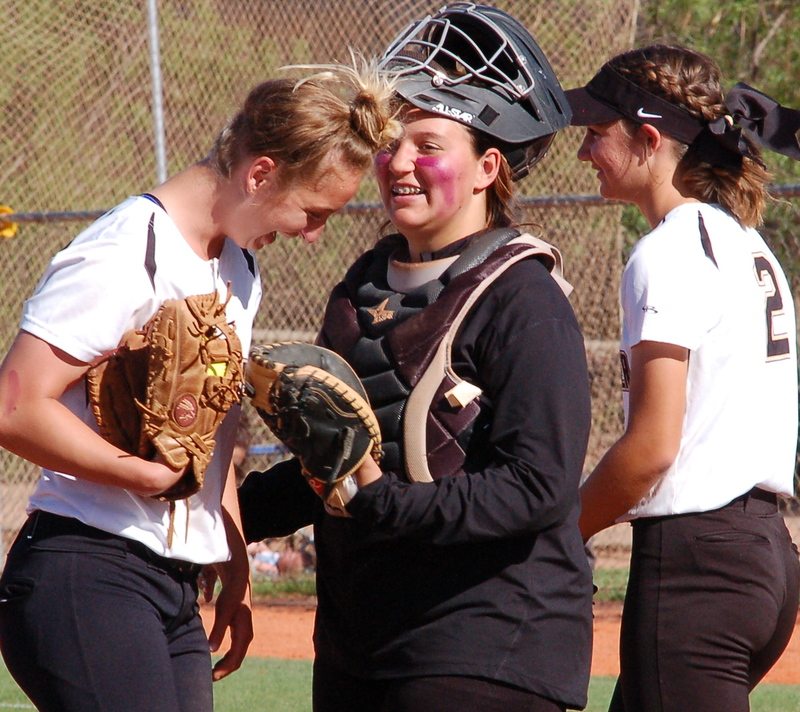 In the bottom of the inning, Desert Hills started with St. Clair on second. Philips took first when she was hit by a pitch and Kylee Christensen walked on four straight pitches to load the bases. Betts then turned on a 2-2 fastball, sending a line drive several feet over the left-field fence. It was her third hit of the game to go with a single and double. St. Clair and Oakley Giacoletto got the only other hits off Jensen. On the mound, St. Clair gave up six hits while striking out seven batters, walking one and hitting two others. In the bottom of the first, St. Clair led off with a single to center, advanced to second on a sacrifice bunt by Philips and to third on a passed ball. She was gunned down at the plate, however, when she tried to score on a ground ball to shortstop. Betts followed with a single that put runners on first and third, but Jensen got the final out of the inning. 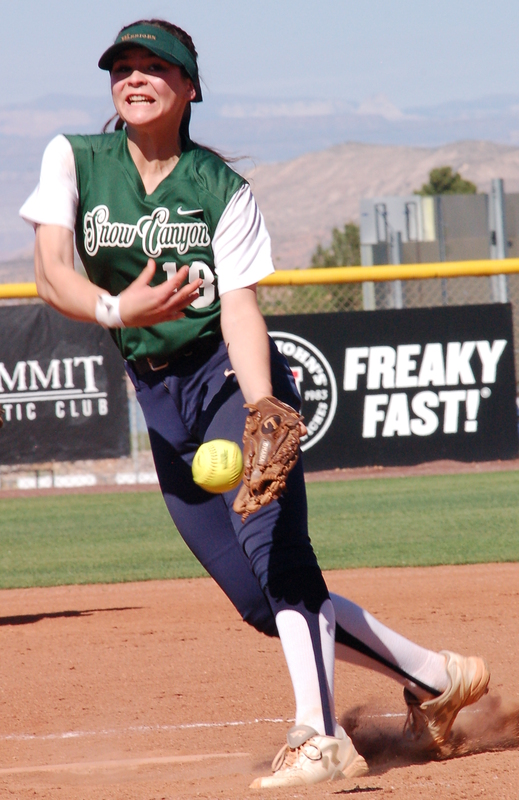 Snow Canyon threatened in the third with one out when St. Clair hit a batter and surrendered a single to Demming, but she got out of that jam with a fielder’s choice and a fly ball to center. In the bottom of the third, Desert Hills had runners at second and third with two outs but couldn’t score. 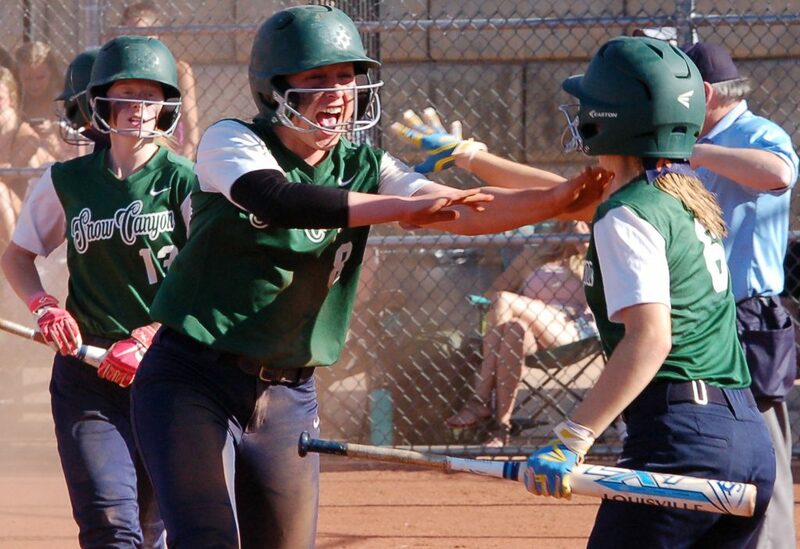 Snow Canyon squandered an opportunity in the fifth when, with one out thanks to Philips’ nifty snag of a foul pop against the Warriors dugout, Kambrie Stewart and Jael Wilde hit consecutive singles and eventually advanced to second and third. However, St. Clair got a strikeout and a pop out to shortstop to keep it scoreless. The Warriors threatened again in the sixth when Marley Moala stroked a leadoff double to left-center, then took third on an infield ground out. She tried to score on grounder by Megan Rogers, but got caught in a rundown and tagged out. She injured her shoulder on the play and had to leave the game. In the course of the rundown, Rogers made it all the way to third. With two outs, Sydney McCaul then grounded the ball between first and second where Thunder second baseman Chelsea Pierce scooped it up and outraced McCaul to first for the final out of the inning. Betts got a one-out double in the sixth but was stranded there. Both teams are in action Friday as Desert Hills hosts Pine View and the Warriors travel to Dixie. In other Region 9 action, Pine View edged Hurricane and Canyon View downed Dixie. Michael Rinker is a veteran journalist returning to Southern Utah, where he previously worked for Best Friends Animal Society and the Hurricane Valley Journal before moving to Arizona in 2010. He learned journalism in Pennsylvania and wrote for the Philadelphia Inquirer and other publications. He also worked at several Florida newspapers, including the Naples Daily News. He can be reached at [email protected] or (435) 218-3518.